CNN's Miles O'Brien is blogging on Hurricane Katrina from Louisiana. CNN's Miles O'Brien is blogging from Louisiana on the impact of Katrina. When I got the first calls from my bosses with my marching orders to Louisiana, I was in the midst of a long drive from Georgia to New York City. I was, at long last, moving my family after a summer of weekend visits. Large as it is, the Yukon XL was packed to the gills with my wife, two children, two big dogs and a lot of stuff we just had to bring. In order to keep the natives from becoming restless, I allowed them to purchase some DVDs to play along the way. Unbeknown to me, my 12-year-old son was watching a TV miniseries called "Category 6: Day of Destruction," which tells a tall tale of three huge storms, a huge power failure, a retiring weatherman, a smart, ambitious TV reporter and a dedicated tornado hunter trying to save Chicago from apocalypse. They apparently fail. Lots of people die -- that's entertainment. So you can imagine what went through young Murrough's head [when he] pulled off the headphones and discovered I had been on the phone coordinating a trip to a Category 5 storm. He was by no means a happy camper. I spoke at length about reality versus fiction -- and it seemed to calm him down. But he has not enjoyed this morning one bit. Called him a few minutes ago though, and he sounded relieved. What a morning. As it turned out our calculation was correct. The Louisiana State University campus in Baton Rouge was the perfect place to field anchor "American Morning." It was close enough to the action to put me "in the story" -- and yet not so severe that I was unable to interview people -- and keep the program rolling. New Orleans would not have worked as well -- and for that matter Anderson Cooper's location a mile or so from me on the Mississippi River would not have worked either -- too hard to hear and speak clearly. When it was all over, LSU Chancellor (and former NASA boss) Sean O'Keefe led us to a campus cafeteria for some breakfast. After arising at 2 a.m. CT and working until 9 a.m. in the driving rain -- I found the school fare pretty darn close to perfection. I guess they have improved institutional food since my college days -- or maybe my standards were a little lower this morning. 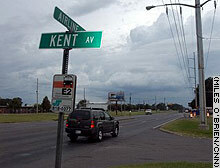 Katrina is arriving in Baton Rouge. The wind and rain are picking up significantly. We all got about two hours sleep last night -- and a little coffee sure would suit me fine. We might be getting some caffeine relief soon though. Producer Dana Garrett is on the way. She will earn my everlasting admiration -- the moment I see that warm cup of Joe. In the meantime, I am falling asleep at the keyboard! [Among our guests on "American Morning" is] Ted Falgout, port director, port of Fourchon -- a key oil and gas hub 60 miles south of New Orleans on the Gulf of Mexico. The focus: How will the storm impact oil/gas prices and infrastructure? Here is what he told us: At the end of the day, our port will make up 16 to 18 percent of the nation's oil supply, which is extremely significant and dead center of where the storm will hit. The storm will impact oil and gas infrastructure, not just short term but long term as well. The impact of the storm -- the Gulf is shut down; all of the area of the storm is shut down; a half billion dollars a day of oil and gas is unavailable. If there is serious infrastructure damage, the price of oil could easily get to $100 a barrel within a week. I testified last week in front of Congress. Our energy system is in serious trouble. [On "American Morning"] I will speak with Ivor van Heerden, deputy director of the Louisiana State University Hurricane Center and director of the Center for the Study of Public Health Impacts of Hurricanes. Among the things he told our producer: "We're talking about in essence having -- in the continental U.S. -- having a refugee camp of a million people." We're talking about an incredible environmental disaster." "We may be about to experience our equivalent of the Asian tsunami. Floodwaters will carry with them toxic waste." We are back in business this morning. With two hours sleep and no coffee, we all begin this momentous day a little groggy. It is not too bad so far here on the campus of Louisiana State University in Baton Rouge. My wind gauge has only clocked about 10 mph gusts. Temperature is mild -- 75 degrees and the humidity is 97 percent. The "calm before the storm" is a cliché, but this is it. Katrina's wrath is real and profound, and it is just a matter of time. All we can do is wait. Every time I listen to CNN's Chad Myers, I learn something new. He is more than a meteorologist. He is a walking, talking encyclopedia of knowledge. I cannot think of an occasion when I have stumped him on -- or off -- the air. We have worked out all the logistics at LSU. Lots of time spent on where to park the truck and how to back it up if the wind starts rattling our satellite dish. We think we have a good setup, and I am exhausted after a long, long day of travel and trepidation over how best to cover Katrina. New Orleans Mayor Ray Nagin told folks to make sure they fill their upstairs bathtubs with water, and in case of real trouble, make sure you have a way of hacking through your roof -- so you are not trapped by rising water. Mayor Ray Nagin, on WWL-AM a few minutes ago, says: "Seventy-five percent to 80 percent of people have evacuated -- 30,000 people have evacuated to the Louisiana Superdome [the primary evacuation site]. Last bus left for dome at 6 p.m. local time. If people still need to get there, they will accommodate. "We are in lockdown mode now. "The worst will be after the storm passes through." 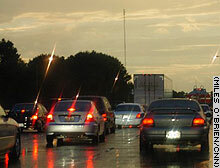 Heavy traffic fills Interstate 12 Sunday evening near Baton Rouge. Interstate 10 was closed down at the intersection of Interstate 55 west of town. So we are headed north on 55 now -- traffic running about 40 mph. We will head to Interstate 12 and then west to Baton Rouge. Weather is classically tropical. Rain waxes and wanes as the so-called "feeder bands" of rain clouds pass overhead. We have now been on the road for about three hours. The governor is holding a news conference now. There is a sense of real anxiety in people's voices as they speak about Katrina. There have only been three other Category 5 storms to hit the U.S. in recorded history: the 1935 storm (Florida Keys), Camille in 1969 and Andrew in 1992. Continental Flight 716 is a virtual charter for us this morning as we start steaming for the Crescent City. Producer Dana Garrett is joined by a crew from ABC News, CNN's Adora Udoji and one couple prematurely ending their New York vacation to return home and nail plywood to their window frames. Sunny, blue skies here. Off to the south an ominous wall of cloud. Hope they still have some batteries in the Big Easy. Hope Mother Nature goes easy. Alex Vidal. His girlfriend is "driving him crazy." He is doing an outstanding job under duress. These storms bring out the best -- and worst in us. 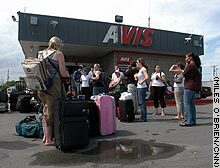 Customers wait to rent cars at the New Orleans International Airport. As I wait in line here at Avis, I am growing more and more impressed with the employee at the counter. Not only are the customers often cranky -- or worse -- but he is fielding a barrage of calls from his family wondering when he is coming home. Time and again, he counsels patience: "I have a lot of customers to take care of. ... Because it's my job. ... Yes, we do have cars, honey. ... Gotta go. ... Talk to ya later." He should get a Katrina bonus. The caboose out of town? Few cars are left on the road as Katrina draws near Sunday. Our satellite truck operator had to stop for fuel. We pulled over to wait -- and decided this was a good chance to get some pictures of people making their way out of town ever so slowly. But the moment we stopped, the road cleared. Makes us think we are the caboose out of town. No hurry. We will certainly be able to catch up with the traffic once we get going again. After several hours of considering all kinds of logistical and safety issues, we have decided to move to Baton Rouge. The hotel location near the French Quarter in New Orleans was good for our personal safety (we could operate out of the fourth floor in an interior hallway during the worst of it), but parking the satellite truck would be a problem. Since the streets of New Orleans sit mostly below sea level, it would very likely become a satellite submarine as the storm water surges into the city. Using small satellite phones to dial in for a lower resolution signal seemed like an option but even that was not assured. I called my friend (and former NASA Administrator) Sean O'Keefe at his new post -- chancellor of Louisiana State University. Turns out they recently installed a fiber optic link to the studio at the school and local station -- and CNN affiliate -- WWL is evacuating their operation to that studio. Nevertheless, we can go set up our satellite truck there (much higher ground) and stay on the air throughout the storm. We might also have some emergency access to that fiber optic connection. So while we won't be right in the middle of the city -- we will be close enough to cover the story but far enough to stay on the air and remain safe. When people see us on TV being battered in the wind, they are unaware of the thinking that goes into these decisions. It is a carefully calculated risk. Traffic on Airline Highway, meanwhile, is not moving a bit. This will be a long ride to Baton Rouge -- only 80 miles away -- but might as well be half a solar system tonight. I should have looked more carefully -- ended up on the wrong car rental bus here -- tried to get a Hertz car -- but they are not accommodating walk-ups. Got one of the Hertz car jockeys to take us to Avis (two lots down the pike). While en route, we asked Sal whether he was evacuating. He said he lives in the city near the lake -- but still plans to stay put. "When your number's up ..., " said Sal, displaying the fatalism characteristic of those who have lived along the Gulf -- and weathered many storms -- over the years. Twenty years ago this Labor Day, I flew into Tampa (breaking off a vacation in Nantucket) to cover Hurricane Elena. The Delta 757 was nearly empty -- except for a couple who had been married the night before. Yes, they were on their way to their honeymoon. I was the bearer of the bad news: The barrier island where they were headed was evacuated. In the midst of their big day, they had missed a memo. My iPod shuffled its way to Pete Fountain mid-flight. Listening to "Way Down Yonder in New Orleans." Wish I was on my way to hoist a Hurricane from Pat O'Brien's -- instead of covering one named Katrina. This morning as we arrived at Newark with one-way tickets booked only 12 hours prior to departure, we all received secondary screening from the Transportation Security Administration. I am going to go out on a limb and make a prediction: Terrorists will pop for a round-trip booking if they try to use airplanes as cruise missiles again. Perhaps we should learn from the past war -- instead of fighting it over and over again -- mindlessly. Katrina is bearing down on the Gulf Coast -- and it is shaping up to be a historic storm. While most smart people are heading for higher ground, we have come to what looks like ground zero -- or in this case, subzero. Much of New Orleans is below sea level. The only place lower in the U.S. is Death Valley. Not a great place to be in a giant Category 5 storm. But here we sit -- ready to tell the story -- as best we can.